The Dittrick traces its origins to 1898, when the Cleveland Medical Library Association (est. 1894) created a “historical committee” headed by Dr. Dudley Peter Allen. A prominent surgeon, Allen had been researching and writing about local medical history since the 1880s. His committee came into being to care for instruments and mementos donated to the Association by Allen himself and fellow surgeon Gustav C. E. Weber in 1897. These artifacts found a home in a display cabinet in the Prospect Avenue home of the Association, and comprised a nascent museum. In 1906 the Association made a sizeable addition to its site and opened there a small museum of “many objects of professional interest.” Allen continued to collect and head the committee until his death in 1915. In the early 1920s President Vinson of Western Reserve University appealed to the Cleveland Medical Library Association to relocate their collections to the campus area, today known as University Circle, and offered land at the corner of Adelbert and Euclid. After Dudley Peter Allen died in 1915, his widow, Elizabeth Severance Allen, donated funds for a building in memory of her husband, the Allen Memorial Medical Library. Mrs. Allen stipulated that her gift would be for a library and museum, reflecting Allen’s lifelong fascination with antiques and medical history. The design of the building by architects Walker and Weeks thus featured a museum gallery on the third floor, something quite unusual for medical libraries of the time. At the opening of the Allen Memorial Medical Library in 1926, Dr. Harvey Cushing (America’s premier neurosurgeon, lifelong bibliophile, and native Clevelander) gave the dedicatory address, The Doctor and His Books. 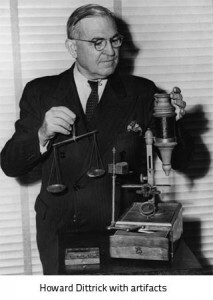 Dr. Howard Dittrick (1877-1954) was named curator of the fledgling “Museum of historical and cultural medicine” that same year. Dittrick sought guidance in medical museology from British and Continental colleagues, as well as Frederick A. Whiting, director of the Cleveland Museum of Art. He acquired medical artifacts ranging from Roman surgical instruments to the saddle bags of “pioneer” doctors of the Western Reserve (those of Peter Allen may be viewed in one of the museum hallway cases). Because Dittrick collected before the rise of a market for medical antiques, he amassed a huge array of artifacts at little expense. Thus we have one of the most comprehensive collections of surgical instruments and medical equipment in all of America. To read more about Howard Dittrick’s European travel, click here. Meanwhile, the collection continues to grow through donation of important collections (such as the Percy Skuy collection of historical contraception, and the Blaufox Hall of Diagnostics). The Dittrick Museum took a new name in 1998 as the Dittrick Medical History Center to reflect the variety of collections (artifacts, rare books, archives, and images) that reside here. At that time the Dittrick became an interdisciplinary studies center of the College of Arts and Sciences of Case Western Reserve University. We cater not only to the curious public, but also to students, researchers, physicians and faculty. The museum itself remains public and free of charge. Internationally notable collections at the Dittrick include endoscopy, medical images, and contraception. Strengths in our rare book include Freud, Darwin, dermatology, obstetrics, surgery, and anatomy, as well as the library of Nicolas Pol, Renaissance physician to the Holy Roman Emperor. Examples of leadership by Dittrick staff include founding the Medical Museums Association (1986), online cataloguing of artifacts (1990-95), and serving as Secretary General of the European Association of Museums of the History of Medical Sciences (2009+). In 2009 the Dittrick hosted the 82nd annual meeting of the American Association for the History of Medicine, and in 2017, in collaboration with the newly installed, NEH-funded digital interactive wall (How Medicine Became Modern), the Dittrick will host a symposium on digital technology in museums and education, with a keynote by the director of Wellcome Trust, London, UK. We continue to be a force in the field, and a center of our community.